Eternal Orthodox Church calendar for the 24.04 year 2019. He is mentioned in the Book of Revelation as 'Antipas My faithful martyr, who was slain among you where Satan dwelleth' (Rev. 2:13) - the city of Pergamum. The inhabitants of this town dwelt in the darkness of idolatry and in the depths of impurity: they were slaves to their passions, slanderers, bullies, incestuous; in brief, slaves of Satan. There among them lived Antipas 'as a light in the midst of darkness, as a rose among thorns, as gold in mud'. He who would seize and kill a Christian was regarded as good and just. The whole of their idolatrous faith consisted in soothsaying, the interpretation of dreams, the service of demons and the extreme excesses of debauchery. In terror of Antipas as of fire, the demons appeared to the pagan priests in their dreams and told them how greatly they were in fear of him, and how this fear was driving them from the city. The priests stirred up the multitude, and they began to torment him and to press him to deny Christ and worship idols. Antipas said to them: 'When your so-called gods and lords of the universe are afraid of me, a mortal man, and have to flee the city, why do you not learn from this that all your faith is in vain?' And the saint spoke further with them of the Christian faith as the only true and saving Faith. But they became incensed like wild beasts and dragged the aged Antipas before the temple of Artemis, where there stood an ox cast in bronze. They heated the ox and threw the servant of God inside. 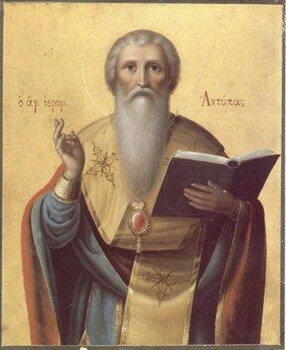 St Antipas, inside the red-hot ox, glorified God with thanksgiving, like Jonah in the whale and the Three Children in the burning fiery furnace. Antipas prayed for his flock and for the whole world until his soul parted from his exhausted body and went to join the angels in the Kingdom of Christ. He died under torture and was crowned with unfading glory in the year 92. They were warders in the Roman prison where the Apostles Peter and Paul were held captive. 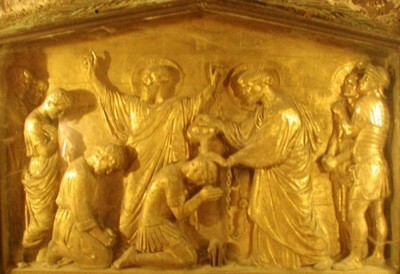 Hearing the words and seeing the miracles of these apostles, they were baptised and released the apostles from prison. The apostles left Rome, but the Lord appeared to Peter on the Appian Way. 'Lord, whither goest Thou? ', asked Peter of Him, and the Lord replied: 'I'm going to Rome, to be crucified afresh.' The apostles returned to Rome in shame, where they were arrested and killed; the two courageous martyrs, Processus and Martinian, being beheaded along with Paul. The Monk Pharmuphios lived during the IV Century at that wilderness monastery, where within a well asceticised the Monk John (Comm. 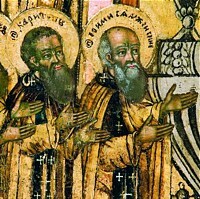 29 March), to whom the Monk Parphumios gave food. The Monk Jakov of Zheleznoborovsk, a son of the boyar-noble Anosov (or Amosov) line, which had their lands at Kostroma Galich, was born in the second half of the XIV Century. As a youth he went to the Monk Sergei of Radonezh, accepted from him monastic tonsure and for several years he lived at the Trinity monastery. In 1392 the Monk Jakov settled in a dense forest near iron mines, at a place which was called the Iron Pines, at the banks of the rivulet Tebza. His sanctity of life was known of already in his own time. In 1415 the wife of GreatPrince Vasilii Dmitrievich (1389-1425), Sophia Vitovtovna (in monasticism Synkletikia, + 1453) fell seriously ill before childbirth. The greatprince dispatched a message to the Monk Jakov beseeching that the monk pray for his wife, and asking whether she would live. The monk bid him pray to the holy Martyr Longinus and foretold the happy birth of a son, Vasilii. (In 1450, this son, GreatPrince Vasilii Vasilevich (1425-1462), after his victory over prince Dimitrii Shemyaka, visited the monastery of the Monk Jakov and prayed there with gratitude). 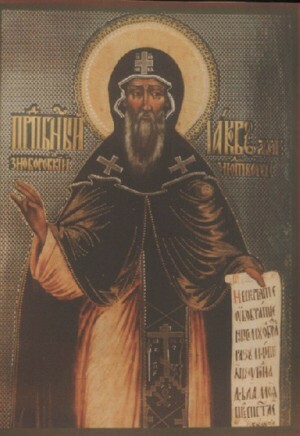 The grateful prince Vasilii Dmitrievich generously rewarded the Monk Jakov and gave him the means to build at the place of his efforts a monastery with a church in the name of the holy Prophet John the ForeRunner. In 1429 the Khazan Tatars laid waste the surroundings of Galich. The Monk Jakov with his disciples hid deep in the forest. Returning, they found the monastery in ruins. Everything had to be rebuilt anew. The monk built a church in the name of Saint Nicholas, and he dug out ponds with the brethren. On the example of the Trinity-Sergiev monastery a strict common-life rule was introduced. Many of the hungry and destitute people, devastated by the Tatars, were fed at the monastery. After many years of efforts in common, the monks besought the Monk Jakov to be their hegumen. He humbly submitted to their request and journeyed to Moscow, where he was bestown the priestly dignity. The monk died a venerable elder on 11 April 1442 and was buried at the John the ForeRunner church of the monastery founded by him.